From June 1 to 12 the Horizon Poker Network sites will be running daily $2.20 buy-in step-one qualifiers at 3am, 2pm, 6pm, 9pm and midnight London time. Winners will then be entitled to take part in $11 buy-in step-two games, which are to then award seats into a $110 buy-in final set for 9pm on June 12. Those that have failed to secure their spot in this concluding game can secure their seat via a $1.10 buy-in last chance tournament scheduled for June 12 at 4:30pm. 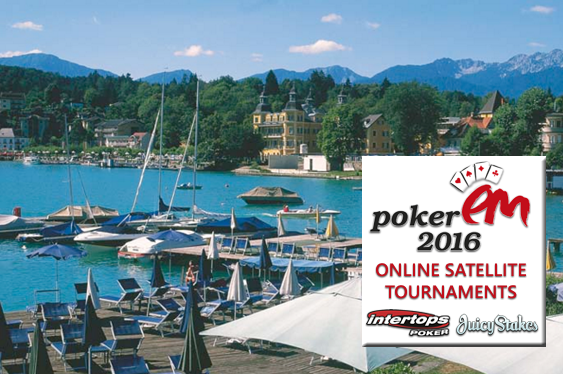 “Velden is a lakeside summer health resort with sports and outdoor activities like golf and hiking,” read a statement from Intertops Poker. Online poker sites are running three-stage satellite tournament series offering prize packages into the upcoming European Poker Championship. Intertops Poker and Juicy Stakes revealed that the winners of the three-stage qualifiers will receive prize packages worth €4,500 ($5,000) for the 27th annual European Poker Championship with its €700,000 ($783,788) pool and set to include their €2,700 ($3,022) buy-in alongside five nights’ accommodation and $500 for travel expenses.